Labor Day is more than a day marking the end of summer and the day we return to real life again. It’s more than a day off work to do other stuff or nothing at all, as nice as that might be. It’s the celebration and commemoration of the hard and faithful workers who’ve built and continue to daily build our nation. Canada, like a good neighbor, celebrates this day right along with us. 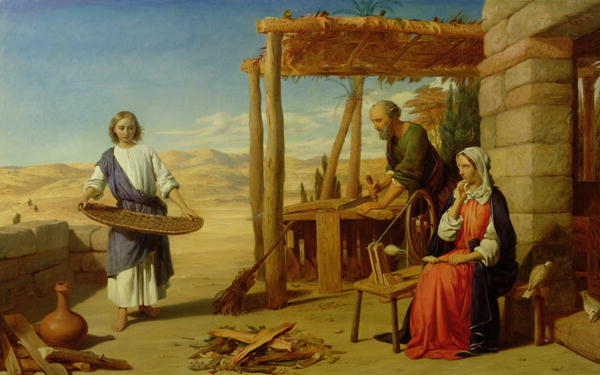 In celebrating the labor we do in our daily lives, it is important for Christians to recognize and remember that work and its importance is central to the Christian story. It is nothing less than divine. All of creation is God’s work, His labor. And when He was done with it, He rested. “Work” is a curious word the scriptures use for God’s creative actions here. And it curious that He who cannot and never tires, He who cannot be exhausted, rested. It is reasonable to suggest that God did not rest because He was worn out, but simply to take a good bit of time to reflect upon and enjoy the work He had done. We should do the same. Our God worked and does work. And what God does is wholly and perfectly divine. And as God created the first two humans on the sixth day, the first command He gave them was to create beings in their own image, just as the Triune God created them in His own image and likeness. This was their first work, and it was delightful, joyful. Following on the foot heals of this, man and woman were commanded to tend creation, to watch over it, harvest it, assist in its fruitfulness as it was created to do. Work: a creative and participatory task to be done as a gift from God by every person who is a unique God Imager in creation. Work is not a product of the Fall. It just got more difficult because of the Fall. It would now draw sweat from our brows, create calluses on our hands, produce aches in our backs and make us tired. It would and will sometimes be fruitless, a failure. But it would still be deeply satisfying to us because there is something deeply divine in it. No human can live a meaningful, happy life without having work that allows them to contribute to something larger than themselves, even if that means sweeping the streets or cleaning toilets. To do that work is better than having no work. And those who have no material need to work because of wealth will find they cannot be happy without work, a task that improves their lives and the lives of others. We are made for work. Consider as well God who became flesh and lived among us. Christ came as the Savior of the world, but didn’t go straight to the “important work” of his public ministry and the Cross. He was actually a bit of late bloomer in that regard. Rather, he lived an average day-in/day-out work-a-day life, just like anyone else does. And he did so for three decades, so there was a great deal of daily work there. We don’t know what He did; the scriptures don’t give us much of a picture there. But He wasn’t a loaf. The Savior worked. And what the Savior did, as He walked along the earth with us, was divine. The incarnation does not permit Christians a platonic view of work, that which is “secular” and the other which is “sacred”. Work is divine. All work. It is a gift, a blessing. It might not always feel that way, in fact many times quite the opposite. But knowing the Christian story, both at creation and in the incarnation, we know that it is. Happy Labor Day. Blessed day of labor tomorrow. This entry was posted in Uncategorized and tagged Christian life, creation, genesis, incarnation, labor day, the Fall, theology, work. Bookmark the permalink.